Today, the vision of the brand is to expand the creative genius of founder René Lalique by creating breath taking perfume bottles in crystal, reviving exciting and emotional jewellery designs, pushing the limits of the factory by creating decorative objects with its signature satin contrasts, carrying out major architectural projects, crafting a unique Lalique world dedicated to the home, working with renowned artists to produce limited editions in crystal and to recreate its cultural heritage. 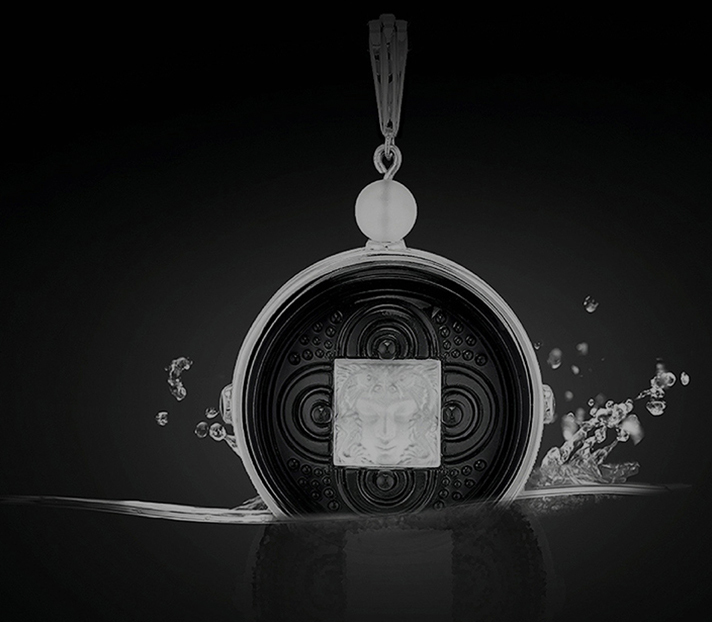 Lalique continues to thrive as a truly timeless lifestyle brand. Lalique has become a powerful icon for exceptional expertise and craftsmanship, a synonym for excellence, and a mastery of contrast between brilliant and satin-finished crystal. It has evolved into a lifestyle, with endless creative possibilities that have René Lalique’s artistic identity as the template. 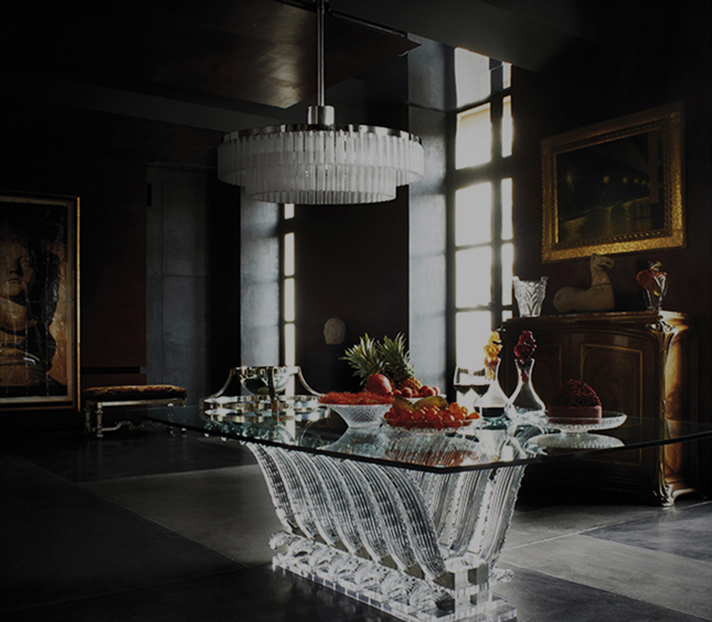 Lalique’s collection of furniture, light fittings, mirrors and ornate crystal panels hold pride of place in the most creative corners of the home. 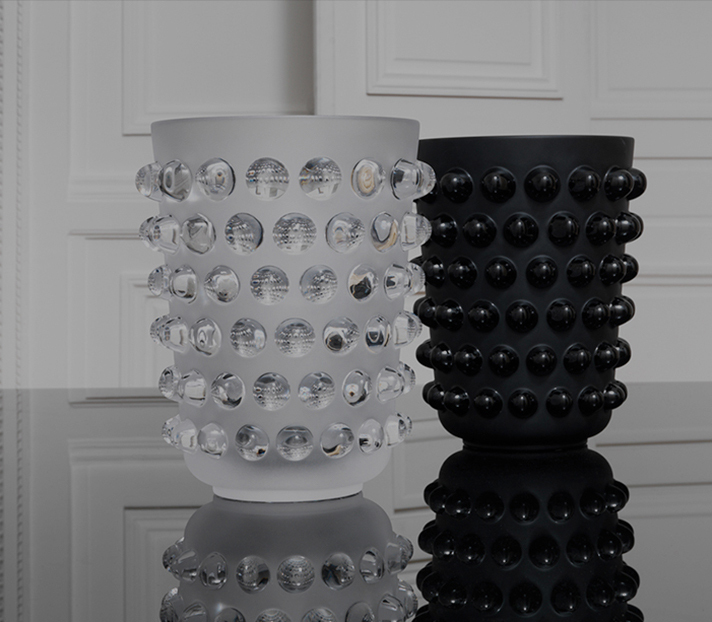 Lalique Maison emerged from the collaboration between Lalique and the internationally renowned interior designers Lady Tina Green and Pietro Mingarelli. It is an enchanting collection of furniture and accessories seamlessly integrated into the most luxurious interiors. 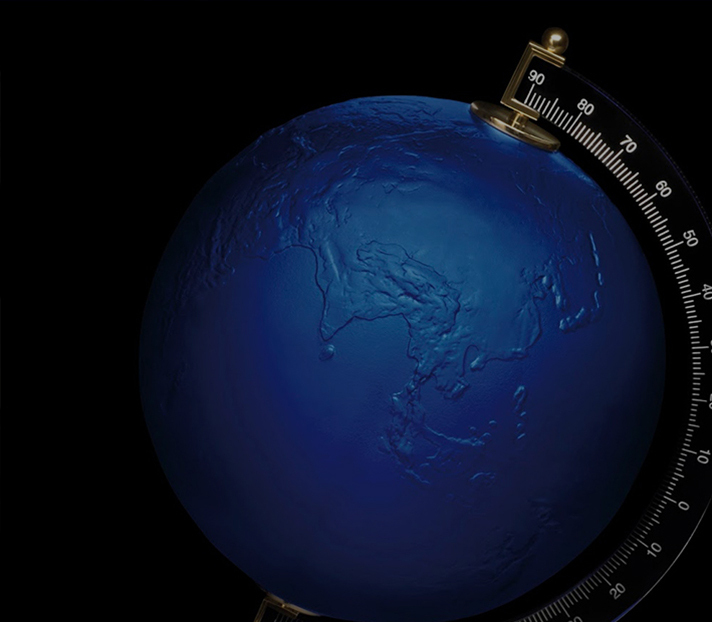 While trends are fleeting, each timeless piece will bridge the gap between vintage and contemporary. In this light, Lalique Interior Design Studio satisfies clients’ demands by creating tailor-made interiors and bespoke objects. Lalique selects exceptional gemstones and materials to create, with impressive virtuosity, stunning pieces whose beauty is enhanced by designs inspired by Nature and myths. Like an alchemist, Lalique transmutes its materials, amongst other things precious and non-precious, lacquer, enamel and patina into light instead of gold. Each piece of Lalique jewellery tells a story grounded in René Lalique's avant-garde vision and legacy. The history of the Lalique brand and that of perfume are closely intertwined, Lalique having played a pioneering role in the development of the modern perfume industry by supplying elegant glass flacons to the most renown brands at the time (François Coty, Molinard, Roger & Gallet etc.). 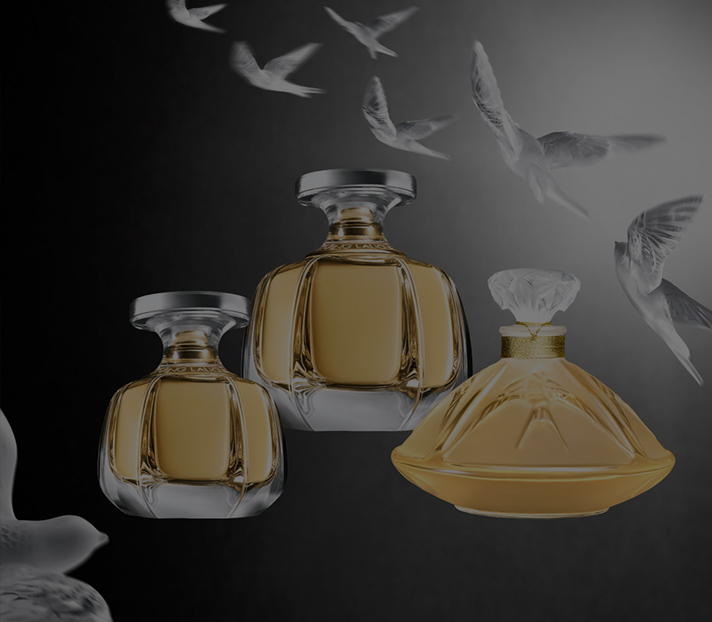 Lalique offers a large variety of scents including regular male and female fine fragrances, crystal limited editions, amenities and home fragrances which have two things in common: distinctive scents composed of the very best raw materials, and unique flacons inspired by the work of René Lalique. Lalique Art places the expertise of Lalique at the service of major contemporary artists, designers with flair, and cultural foundations; the aim is to create unique and exceptional works of art. Offering artists new inspirations and motifs, using the interplay of light, transparency, colour and contours, this extraordinary encounter between art and crystal is giving rise to new forms of creative expression. Lalique Art has collaborated with Damien Hirst, Anish Kapoor, Terry Rodgers, Yves Klein Archives, Rembrandt Bugatti, George Lam, Zaha Hadid and Mario Botta. 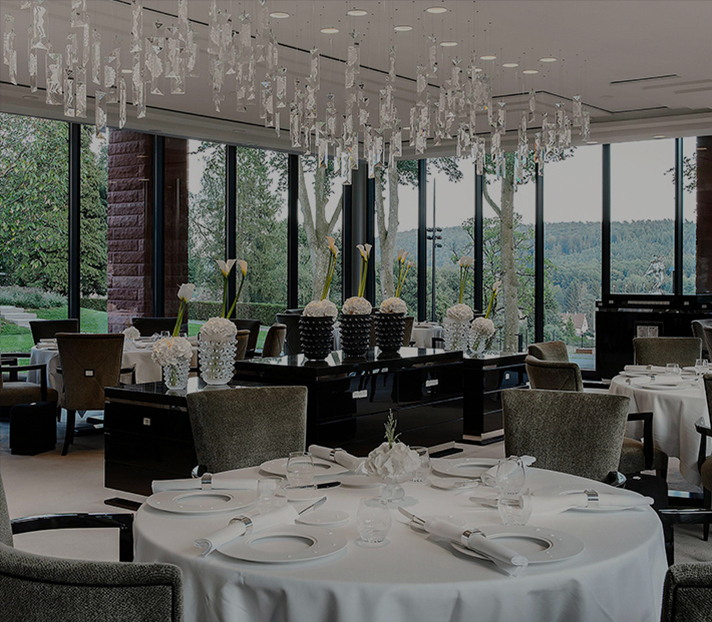 Lalique’s exceptional expertise and heritage is inextricably linked to the art of fine dining and cuisine. Encompassing hospitality venues, Villa René Lalique (5-star hotel and 2 Michelin star restaurant), Chateau Hochberg (4-star hotel and restaurant) and the soon to open hotel and restaurant at Château Lafaurie-Peyraguey on the Holy Grail of Bordeaux Crus Classés in France. In tune with our convictions and our vision for the art of living we are offering a dream with emotional resonance, one which is waiting to be discovered, to be shared and brought to life.